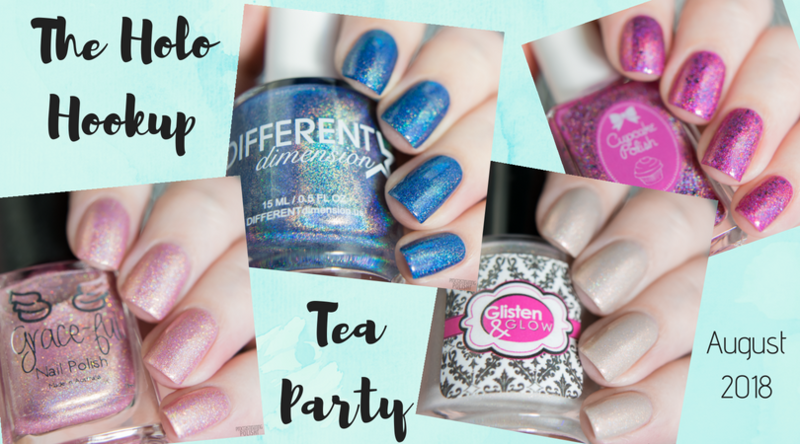 This month The Holo Hookup are having a Tea Party! As someone who loves both nail polish and a cup of tea I was thrilled to swatch this box of sparkly comfort. 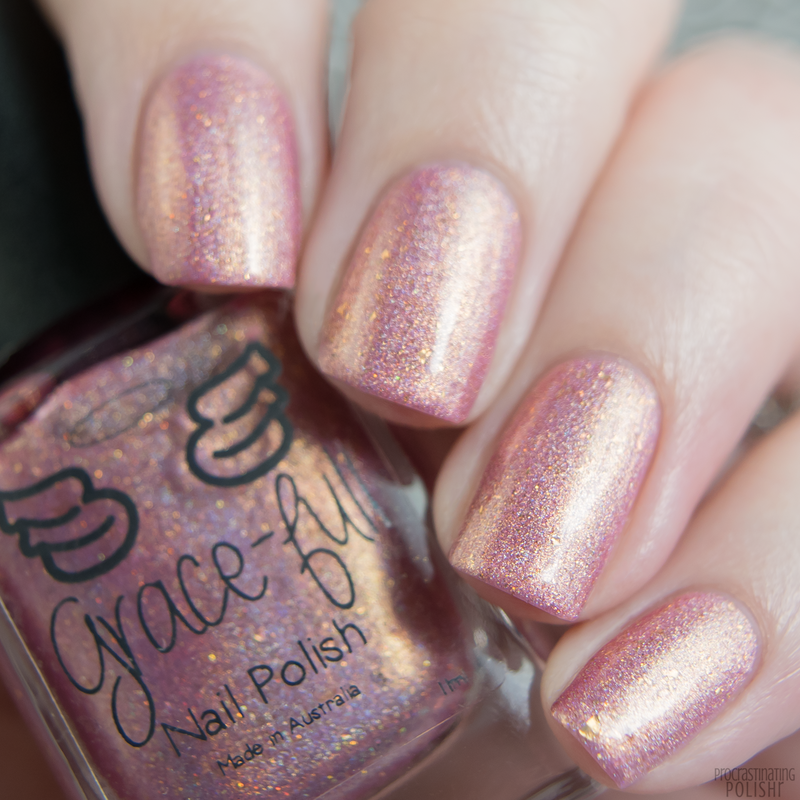 The Holo Hookup consists of Cupcake Polish, Different Dimension and Glisten & Glow with a different guest maker each month, and this month it was local Aussie fave Grace-full Nail Polish! Let's take a look at their creations! 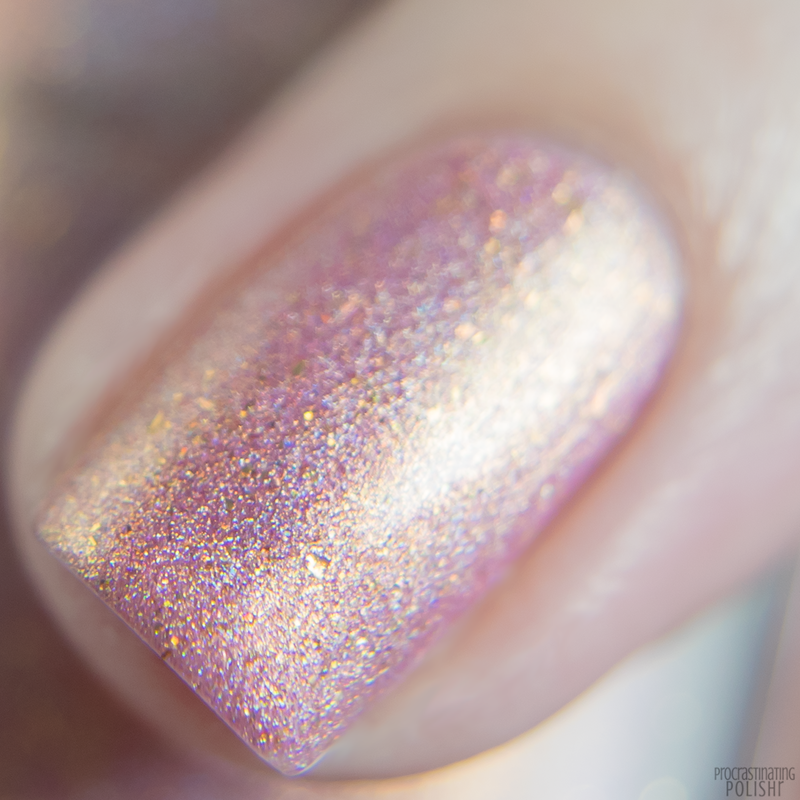 A berry holo base with a rainbow of shifting flakes and a gold to red shifting shimmer. 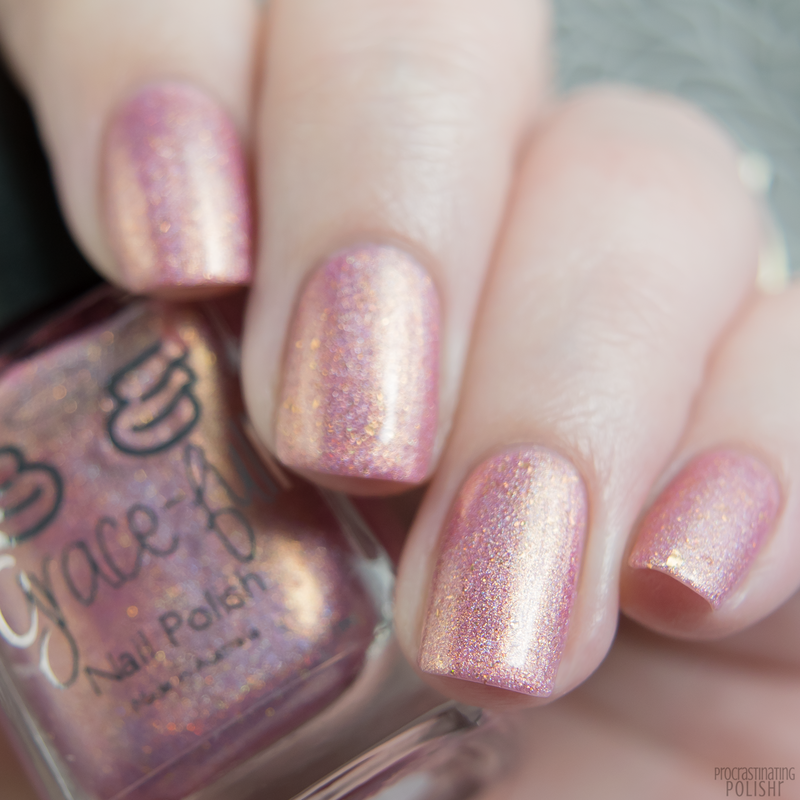 It's a gorgeous explosion of colour and the golden shimmer gives a lovely subtle warmth. I did some watermarble nail art using Hit the Bottle's Bottoms Up Base & Top Coat and Pretty Serious Absence. The formula is rich and full of flakes but is easy to apply and self levels well. It's beautifully pigmented needing two thin coats for solid opacity. I recommend a thick top coat to be sure all the flakes are perfectly smooth once it's dried down. 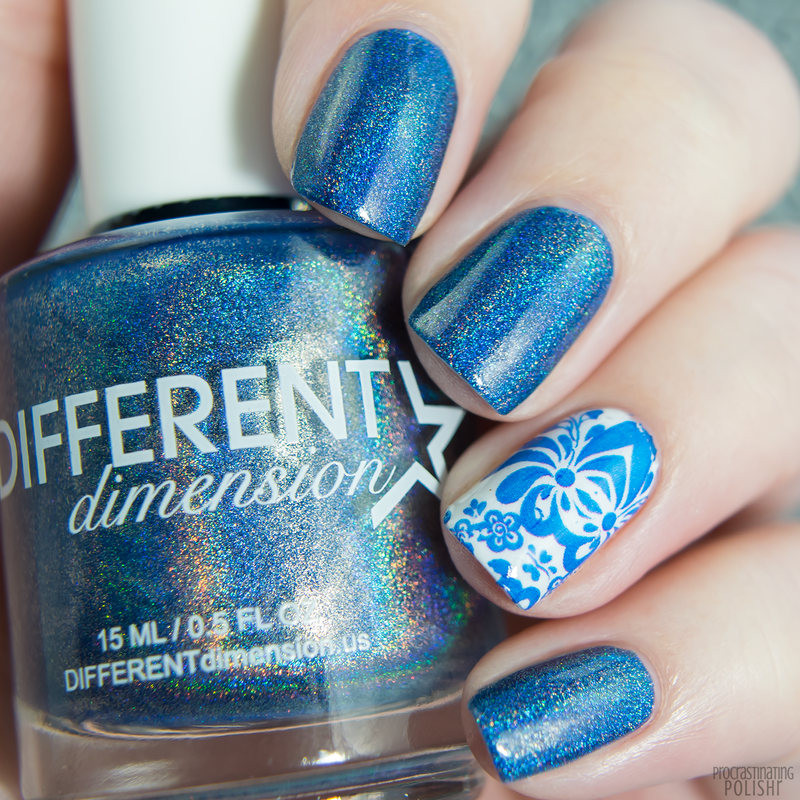 Glowing sapphire blue linear holo. It sounds simple but looks anything but. It's stunningly vivid and there's a beautiful rainbow arc. 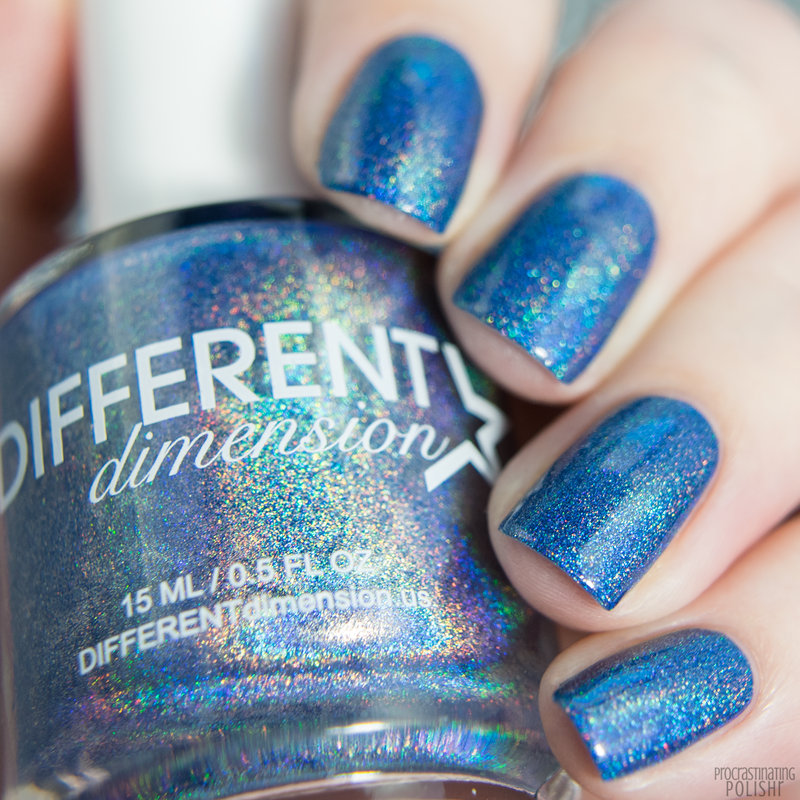 This is my first time trying Different Dimension and I'm super impressed! 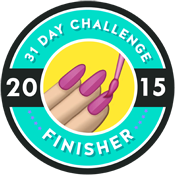 My feature nail is a cute Milv nail decal over Pretty Serious Absence. It reminded me of a classic china pattern and the colour seemed the perfect fit. The formula is easy to use with great pigmentation - just two coats for perfect opacity. 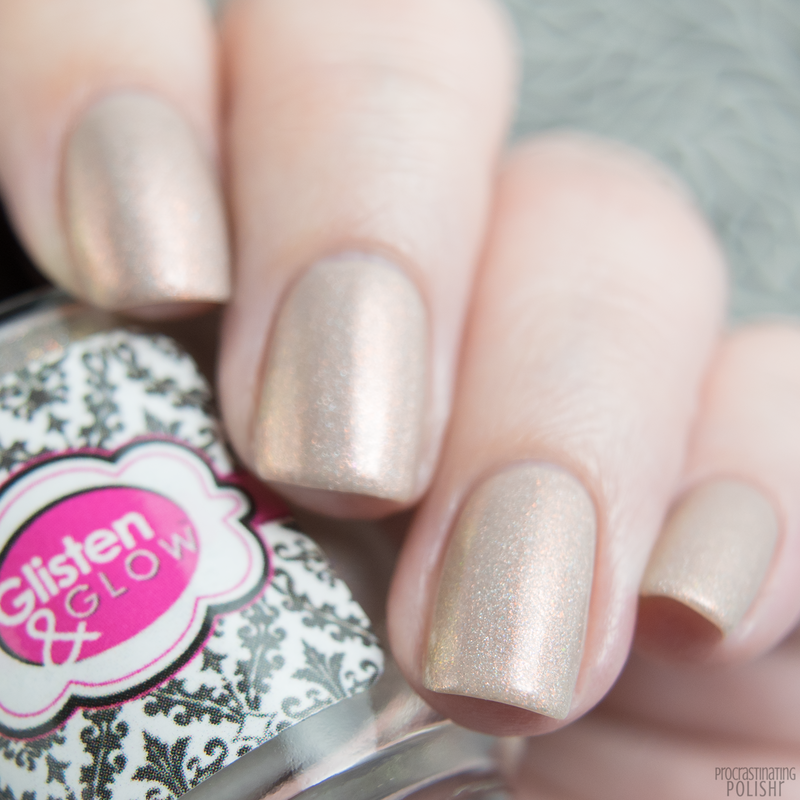 It's a beautiful smooth finish so use your favourite holo friendly top coat with this one. 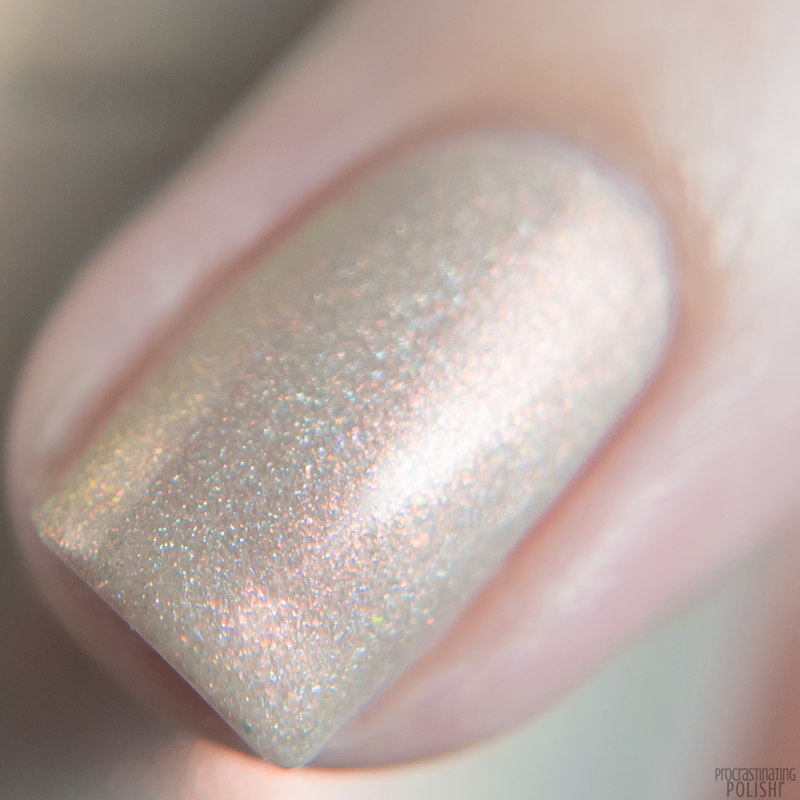 Pale sandy beige linear holo with magical shifting aurora shimmer. It was incredibly difficult to capture this accurately on camera, the aurora shimmer played tricks with my camera as it's so shifty and readily visible in real life! It's less gold toned than my pictures appear, a beautiful neutral shade full of shimmer and sparkle. My nail art is some simple freehand flowers using Emily de Molly Slackers, Bums and Weirdos and Hot Run. 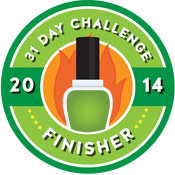 It's a gorgeous smooth formula, sheer on the first coat but builds up to a nice opacity in three thin coats. 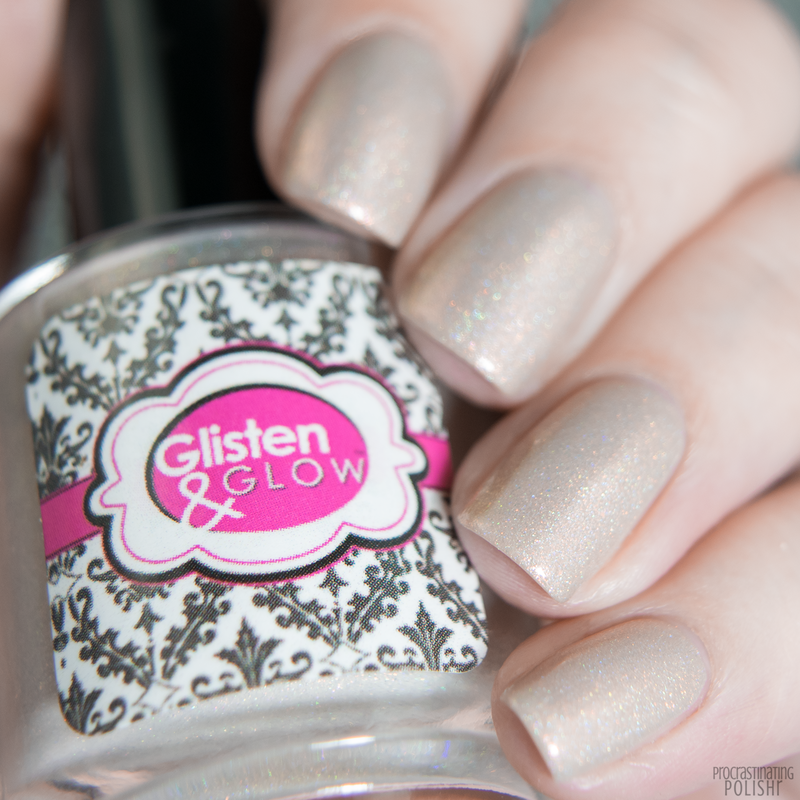 It dries down beautifully smooth so use your favourite holo friendly top coat for protection. 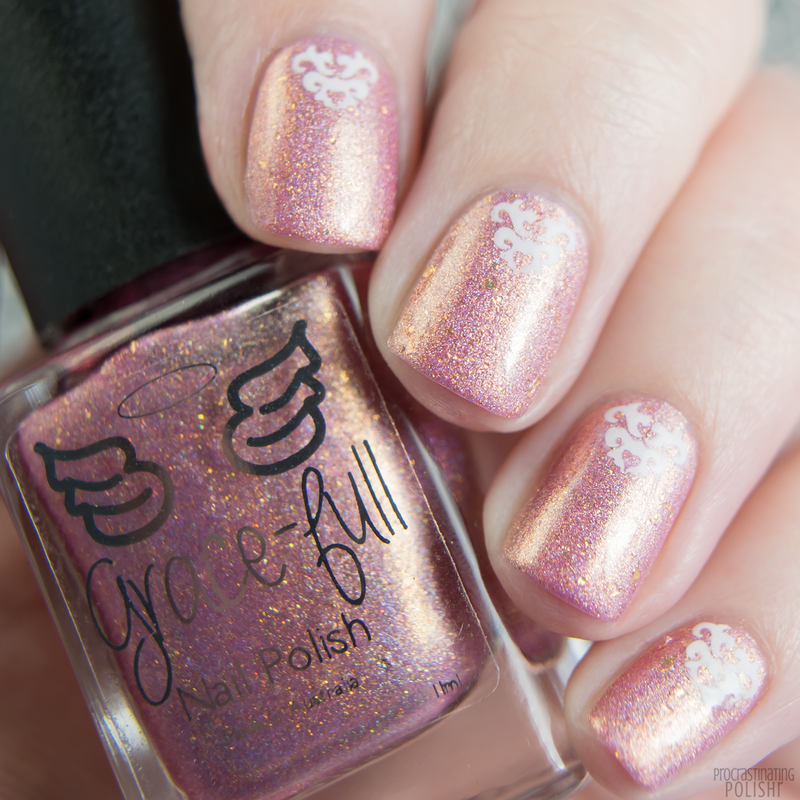 Soft candy pink holo base with golden shimmer and packed with gold flakes. 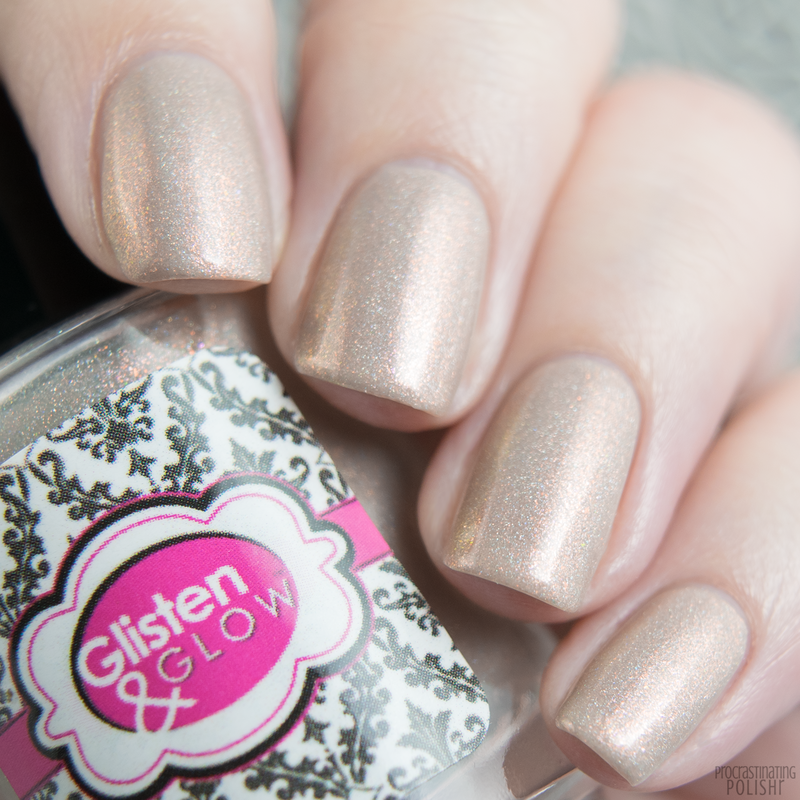 The warm gold shimmer provides a nice contrast to the cooler toned base and the flakes are generous and glowy. 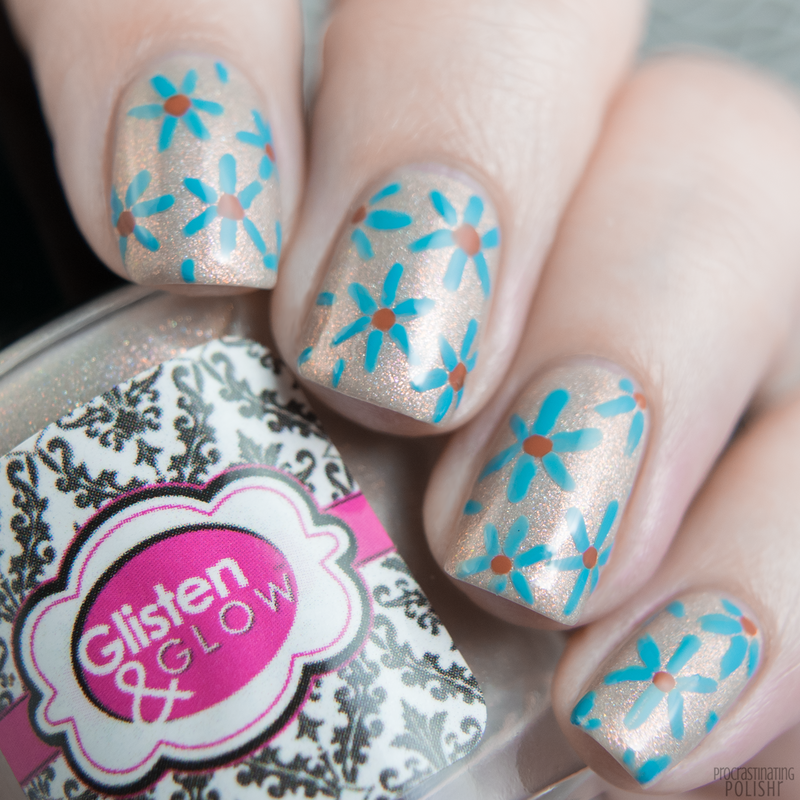 I did some stamping accents with a simple damask style image from a plate from Born Pretty Store, using Powder Perfect White Stamping Polish. The formula was lovely to use, smooth and easy application with the flakes spreading effortlessly. 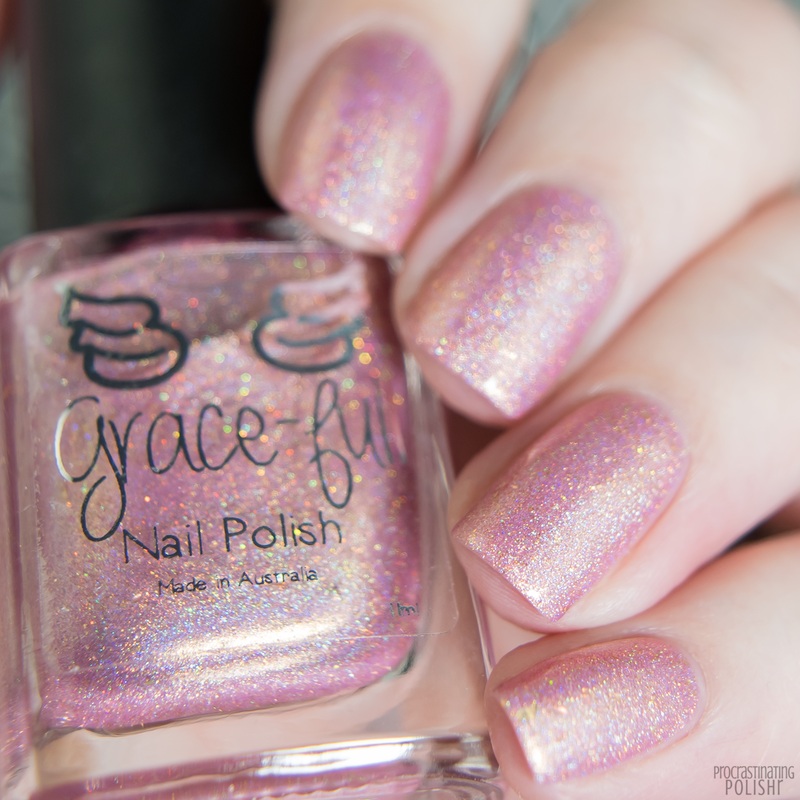 Use a thicker top coat to ensure the flakes remain smooth once dry - I used Grace-full Angel Glaze. The August Holo Hookup box is available for pre-order from Saturday July 21, 2018 at 9pm EDT through to Saturday July 28, 2018 at 9pm EDT. Worldwide shipping is available. Head to theholohookup.bigcartel.com to grab your box from this weekend!